The Solution below shows the C-flat diminished 7th chord in root position, 1st, 2nd, and 3rd inversions, on the piano, treble clef and bass clef. This step shows the C-flat diminished 7th chord in root position on the piano, treble clef and bass clef. The C-flat diminished 7th chord contains 4 notes: Cb, Ebb, Gbb, Bbbb. 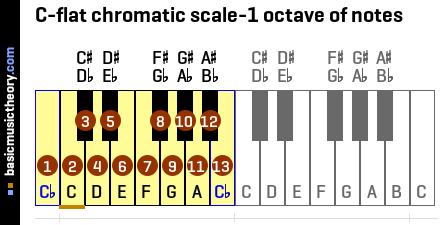 The chord spelling / formula relative to the Cb major scale is: 1 b3 b5 bb7. This step shows the C-flat diminished 7th 1st inversion on the piano, treble clef and bass clef. 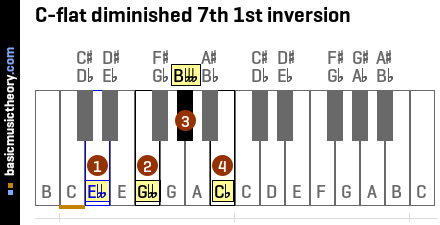 The C-flat diminished 7th 1st inversion contains 4 notes: Ebb, Gbb, Bbbb, Cb. This step shows the C-flat diminished 7th 2nd inversion on the piano, treble clef and bass clef. 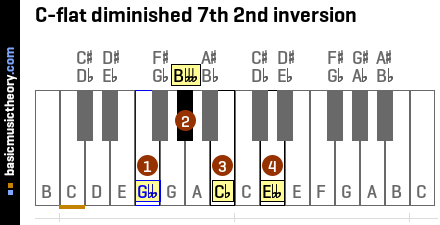 The C-flat diminished 7th 2nd inversion contains 4 notes: Gbb, Bbbb, Cb, Ebb. This step shows the C-flat diminished 7th 3rd inversion on the piano, treble clef and bass clef. The C-flat diminished 7th 3rd inversion contains 4 notes: Bbbb, Cb, Ebb, Gbb. The steps below will detail the diminished 7th triad chord quality in the key of Cb. 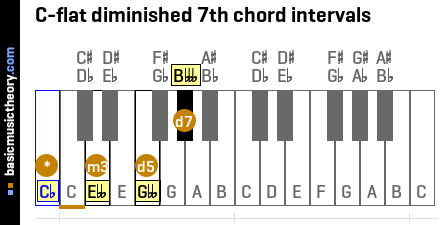 This step defines the note intervals for each chord quality, including the intervals for the C-flat diminished 7th 7th chord. It also shows how the 7th chord qualities are related to the triad chord qualities they are based on. 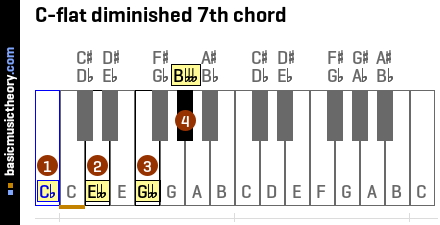 Looking at the table above, the note intervals for the chord quality we are interested in (diminished 7th), in the key of Cb are Cb-min-3rd, Cb-dim-5th, and Cb-dim-7th. 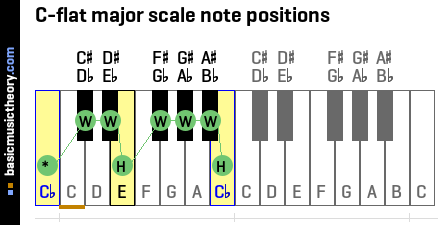 This step shows the C-flat diminished 7th chord note interval names and note positions on a piano diagram. 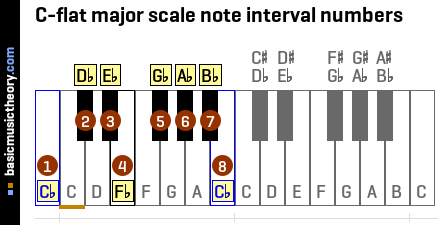 Cb-5th: The 5th note quality of the major scale is perfect, and the note interval quality needed is diminished, so the 5th note scale note name - Gb, is adjusted 1 half-note / semitone down to Gbb. The chord note spelling reflects this note flattening: b5. Cb-7th: The 7th note quality of the major scale is major, and the note interval quality needed is diminished, so the 7th note scale note name - Bb, is adjusted 2 half-tones / semitones / 1 whole tone down to Bbbb. The chord note spelling reflects this note is flattened twice: bb7. So another name for this inversion would be C-flat diminished 7th triad in seven-five-three position. For example, the 7 represents note Bbbb, from the Cb-7th interval, since the chord root, Cb, is the lowest note of the chord (as it is not inverted). . This step shows the first inversion of the C-flat diminished 7th. Based on this numbering scheme, another name for this inversion would be C-flat diminished 7th triad in six-five-three position. This step shows the second inversion of the C-flat diminished 7th. So the second note of the 1st inversion - note Gbb is now the note with the lowest pitch for the 2nd inversion. Based on this numbering scheme, another name for this inversion would be C-flat diminished 7th triad in six-four-three position. This step shows the third inversion of the C-flat diminished 7th. For a 3rd inversion, take the first note of the 2nd inversion above - Gbb, and move it to the end of the chord. 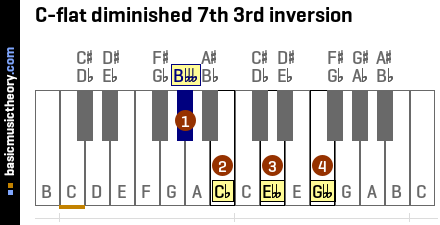 So the second note of the 2nd inversion - note Bbbb is now the note with the lowest pitch for the 3rd inversion. Based on this numbering scheme, another name for this inversion would be C-flat diminished 7th triad in six-four-two position. For example, the 6 represents note Gbb, from the Bbbb-6th interval, since the lowest (bass) note of the chord - now inverted, is Bbbb.